We’d love your help. Let us know what’s wrong with this preview of Return To Glow by Chandi Wyant. Weakened by her recent illness, she walks over the Apennines, through the valleys of Tuscany, and beside busy highways on In her early forties, Chandi Wyant’s world implodes in the wake of a divorce and traumatic illness. Determined to embrace life by following her heart, she sets out on Italy’s historic pilgrimage route, the Via Francigena, to walk for forty days to Rome. "Chandi's search for herself is both ubiquitous and yet singular; her unique voice and honest self-examination speak to our shared humanity as we question our mistakes and seek to find passion, love and fulfillment on our Hero's Journey through life." "Her thoughtful reflection on her short-comings reveals a strength of mind and heart, which really drew me in to her experience. Her internal struggles are very relatable, and she gracefully avoids becoming a victim of her circumstances. I love this book and the lessons it contains." "Her writing style drew me in immediately, placing me beside her, as if I were there. I was affected deeply by her determination and courage to continue..."
To ask other readers questions about Return To Glow, please sign up. The book is set in 2009, when the author decided to walk the ancient "Via Francigena" in Italy in order to arrive in Rome. The memoir is a captivating inner and outer journey and reminds us how to find joy after being at the rockbottom. It is perfect for those who are interested in female solo travels or want to know more about the medieval route that started in Canterbury and ended in Rome. It also gives us the chance to follow the challenges that she faced during the journey and to be happy for The book is set in 2009, when the author decided to walk the ancient "Via Francigena" in Italy in order to arrive in Rome. Home is were the heart is, é um conhecido provérbio inglês. Qualquer coisa como, a nossa casa é onde estão as coisas e pessoas que nos são queridas. Nem sempre a nossa casa está no sítio mais provável ou à mão. A casa de Chandi Wyant é um país, Itália, a que este livro é uma declaração de amor. Um amor que dura há muitos anos e que irá certamente prosseguir, pois neste momento a autora vive naquele país, por escolha. Este livro tem dois aspectos admiráveis. Por um lado, a autora é de uma grande Home is were the heart is, é um conhecido provérbio inglês. Qualquer coisa como, a nossa casa é onde estão as coisas e pessoas que nos são queridas. Nem sempre a nossa casa está no sítio mais provável ou à mão. A casa de Chandi Wyant é um país, Itália, a que este livro é uma declaração de amor. Um amor que dura há muitos anos e que irá certamente prosseguir, pois neste momento a autora vive naquele país, por escolha. Este livro tem dois aspectos admiráveis. Por um lado, a autora é de uma grande coragem ao expor a sua vida e os seus medos numa obra que tornou pública. No rescaldo de uma doença grave e de uma separação que evoluíu para divórcio decidiu voltar aos braços do seu amor, a Itália. Elegeu a peregrinação correspondente à Via Francegina, uma antiga estrada medieval que liga Canterbury a Roma, numa caminhada de quarenta dias, sózinha. No decurso da mesma, Wyant faz uma retrospectiva do que foi a vida até ao momento, passando por recordações dolorosas do seu casamento. a sua honestidade é tanta que partilha connosco os momentos em que, estando sózinha, sentiu tristeza ao deparar-se com cenários de harmonia e felicidade familiar que eram bem diversos da sua realidade. Num mundo onde todos querem parecer muito bem todo o tempo, esta é uma atitude admirável. O outro aspecto que me tocou no livro prende-se com a importância dos gestos das pessoas que com ela se foram cruzando. A maior parte foi simpática, curiosa e amigável. É notável a capacidade da autora reconhecer o relevo que pequenos nadas (para os outros) tiveram na sua disposição, desgastada, não apenas pelo cansaço da viagem, mas também pelos problemas que trazia consigo. O que nos deve fazer pensar que tantas vezes algo que não nos custa nada pode significar a diferença para alguém com quem nos cruzamos. Para além disso, o livro está cheio de detalhes e descrições que são interessantes de ler e úteis para quem queria fazer este tipo de viagem ou algo parecido. Foi, pois, uma boa leitura de início do ano. Home is the heart is, is a well-known English proverb. Something like, our home is where are the things and people that are dear to us. Home is not always at the most likely place. Chandi Wyant'home is a country, Italy, to which this book is a declaration of love. A love that lasts for many years and that will certainly continue, because at this moment the author lives in that country, by choice. You would be missing out on a story that shares the barest of similarities with that oh-so-famous book – “woman heals herself emotionally and spiritually by taking a long hike” – but is absolutely original. 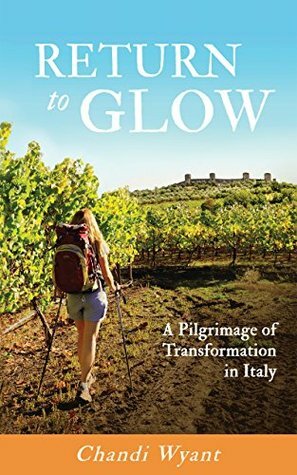 Even more, I found this book to be highly engaging, and really If you came across Chandi Wyant’s fascinating memoir Return to Glow: A Pilgrimage of Transformation in Italy, you might note the athletic-looking blonde woman on the cover and think, “Oh, this is a rip-off of Wild,” and pass it by. This is a tale of two journeys, one through the Tuscan landscape and the other through a mental obstacle course as the author seeks to discard painful memories that block access to her heart. She captures the Italian culture and countryside beautifully while artfully weaving in details about what caused her emotional wounds. Even though I felt (due to my ignorance of European history) that historical discourses interrupted the flow in a few places, I enjoyed her story, her openness, her fortitud This is a tale of two journeys, one through the Tuscan landscape and the other through a mental obstacle course as the author seeks to discard painful memories that block access to her heart. She captures the Italian culture and countryside beautifully while artfully weaving in details about what caused her emotional wounds. Even though I felt (due to my ignorance of European history) that historical discourses interrupted the flow in a few places, I enjoyed her story, her openness, her fortitude to finish her physical and emotional pilgrimage, and her determination to trust her heart and restore the spark she once had. I loved this book! I couldn't put it down. By day 3 I was already 50% through the book. It takes a great deal of courage to do what Chandi did and to pick herself up and pull herself out of such a situation. This book is for anyone who is going through a tough time and wants some faith hat things will work out. It's for Italy lovers, for those going to Italy, for those going through a divorce or tragic illness, for those wanting to do a pilgrimage or those wanting to fin their glow. Whatever your I loved this book! I couldn't put it down. By day 3 I was already 50% through the book. It takes a great deal of courage to do what Chandi did and to pick herself up and pull herself out of such a situation. "Having fixed expectations may block a miracle. If I release expectations daily, it will open me to the unexpected, to possibilities unconsidered, to seeing, as William Blake put it, heaven in a wildflower." ~ Chandi Wyant in "Return to Glow"
Not merely a narrative of self-discovery, this is a love story, one woman's sonnet to a country that has nourished her both spiritually and physically. And certainly courage was required to write much of that sonnet. All women know that being female carries w "Having fixed expectations may block a miracle. If I release expectations daily, it will open me to the unexpected, to possibilities unconsidered, to seeing, as William Blake put it, heaven in a wildflower." ~ Chandi Wyant in "Return to Glow"
And certainly courage was required to write much of that sonnet. All women know that being female carries with it certain challenges in an unsafe world. ("The more I traveled, the more I was a constant intruder into male trenches.") An intense love of that world, and history, coupled with the pioneering spirit of women gone before, inspired the author even as both at home and abroad there were relationship difficulties and health challenges to be navigated. "Non aver paura!" Don't be afraid. And so she set out, in her forties, following a traumatic illness and the death of a marriage, to walk (solo, no less) partway across Europe—more than 250 miles from northern Italy to Rome—in search of her lost "glow" (the time when "I loved the world and it loved me back"), encountering the usual cast of guardian angel and con artist characters along the way. There are blistered feet and blazing heat, energy bars and pesto pasta. Skinny-dipping in cerulean waters. Frescoes and foot-washing and hole-in-the-floor toilets. Wine and conversation. Monks and nuns and saints.Stereotypes and enlightenment, heartbreak and absolution, all rendered for the reader in strikingly vivid, articulate, and unsparingly honest prose. Cultured, adventurous and well-traveled at an early age, the author seamlessly weaves her early life experiences with those more recent, revealing what has brought her to Italy, the country she loves like no other. It’s a very grounded yet inspiring story that takes us through her modern-day experience of an ancient pilgrimage…..all brought on by an acute, life-threatening illness and simultaneously painful divorce process. The day-to-day accounts of her journey are honest, relevant, funny, roman Cultured, adventurous and well-traveled at an early age, the author seamlessly weaves her early life experiences with those more recent, revealing what has brought her to Italy, the country she loves like no other. It’s a very grounded yet inspiring story that takes us through her modern-day experience of an ancient pilgrimage…..all brought on by an acute, life-threatening illness and simultaneously painful divorce process. The day-to-day accounts of her journey are honest, relevant, funny, romantic and sometimes gritty – mostly when describing the less-than-ideal conditions she encounters during the 250 mile walk. Her story is masterfully interspersed with rich historical detail along the Via Francigena, and her style of writing made me feel as though I could easily be right there on the trail with her. Her thoughtful reflection on her short-comings reveals a strength of mind and heart, which really drew me in to her experience. Her internal struggles are very relatable, and she gracefully avoids becoming a victim of her circumstances (past or present). I love this book and the lessons it contains. 22 would read another book by this author. 21 thought the cover was good or excellent. 21 felt it was easy to follow. 22 would recommend this story to another reader to try. 10 felt the author’s strongest skill was ‘subject knowledge’. 22 felt the author’s strongest skill was ‘writing style’. 22 felt the pacing was good or excellent. 22 thought the author understood the readership and what they wanted. The subtitle of this book is “A Pilgrimage of Transformation in Italy”, and it falls in the genre “Women traveling to get over divorce/breakdown/depression/and or mid-life crisis”, within the sub-genre “Travel to Italy”. Actually, the book is less the purported memoirs of a walk along Italy's ancient pilgrimage route, the Via Francigena, and more an autobiography that includes the childhood, adolescence and adulthood of the author, and even background on the author's family. The writing is educat The subtitle of this book is “A Pilgrimage of Transformation in Italy”, and it falls in the genre “Women traveling to get over divorce/breakdown/depression/and or mid-life crisis”, within the sub-genre “Travel to Italy”. Actually, the book is less the purported memoirs of a walk along Italy's ancient pilgrimage route, the Via Francigena, and more an autobiography that includes the childhood, adolescence and adulthood of the author, and even background on the author's family. The writing is educated and well-edited, with beautiful quotes from literature and poetry to illustrate many important points. At times the writing rises to the romantic lyricism of Marlena di Blasi in her famous “A Thousand Days in Venice”. At other times the subjects covered by the author seem less for romantics and more for fans of schadenfreude, or for armchair-analysts. Those latter parts were my least favorite. They always make me cringe and say a silent prayer that the author has at least changed the names of the people she exposes. For Italophiles, there is much to enjoy in the book. You'll need to be a fan of this genre of book, Female Travel Therapy, however, to really enjoy the whole book. This is not a guide to the Via Francigena. This is an autobiography of an Italophile who endured the pilgrimage route, ill-prepared for its challenges, while attempting to jump-start her life. I received a review-copy of this book; this is my honest review. A wonderful story about one broken woman's journey to fulfillment. Worn down by life's often cruel and unrelenting blows, Chand Wyant reveals her inner struggles in an intimate yet entrancing way as she reaches deep into her soul to rediscover herself. From the outset, each page leaves you wanting more until the reader and the author become one. Her story starts out screaming of hurt and emptiness and finishes with a vibrant joy. Her choice to walk Italy's pilgrimage route as a vehicle for healin A wonderful story about one broken woman's journey to fulfillment. Worn down by life's often cruel and unrelenting blows, Chand Wyant reveals her inner struggles in an intimate yet entrancing way as she reaches deep into her soul to rediscover herself. From the outset, each page leaves you wanting more until the reader and the author become one. Her story starts out screaming of hurt and emptiness and finishes with a vibrant joy. Her choice to walk Italy's pilgrimage route as a vehicle for healing and rediscovery was brilliant. She takes you on an unforgettable journey through a country rich with history and culture, as she experiences the simplicity of the italain lifestyle blended with an unquestionable respect for the cultural, historical and gastronimcal wonders that Italy deserves. If you love to travel, read this book. If you want to travel, read this book. If you've ever felt alone and broken, read this book. This powerful story is told beautifully. The prose is quite engaging. It is the kind of book that you don't want to end. If anyone is looking to read a very human story, focused on overcoming adversity and chasing your dreams, this is it. And plus it's set in Italy, which in itself is glorious. A lovely read with the perfect dose of wanderlust. I found this book so delicious, I had to force myself to dole it out in smaller bites -- otherwise I would have devoured it in one night. Chandi had me hooked with her writing and narrative in the first chapter when she described limping "on both feet." I knew she and I would get along just fine, and I wished for a time machine, to go back and whisper to her, "We're all right here with you. Your readers are rooting for you Chandi. Now, let's get walking!" The big questions: How can I get myself t I found this book so delicious, I had to force myself to dole it out in smaller bites -- otherwise I would have devoured it in one night. I could not put this book down. It is one part inspiration, one part adventure, one part personal tale and one part travelogue, but all of it was highly entertaining and touching. Return to Glow is for anyone who has ever wanted to be closer to their true selves, for anyone that is seeking to know themselves better, for anyone looking for a way to move beyond difficulties and find a way to connect with their courageous self. It is also for anyone that loves travel or loves Italy, and wants an in I could not put this book down. It is one part inspiration, one part adventure, one part personal tale and one part travelogue, but all of it was highly entertaining and touching. Return to Glow is for anyone who has ever wanted to be closer to their true selves, for anyone that is seeking to know themselves better, for anyone looking for a way to move beyond difficulties and find a way to connect with their courageous self. It is also for anyone that loves travel or loves Italy, and wants an insider’s view of the culture. Chandi’s tale of doing just that resonates for most of us – male, female, any race, any class, any culture. It is a timeless story, as she decides to start her life over (or “reboot” her life) by walking a pilgrimage trail in Italy. She decides, against many odds, to walk the Via Francigena in Italy which leads to Rome. It is an ancient pilgrimage trail, but it is also an ancient and universal ritual – a symbolic passage that has had a renaissance in recent times. Just like her, many of us are hungry for a ritual that reconnects us with ourselves as our societies often separate ourselves from our true nature. She must overcome many obstacles – physical, emotional and practical – in order to start and to finish her commitment to walk the trail. Her experiences remind us of the goodness in humans and the universality of human nature. Chandi takes us through her physical and emotional transformation in a way that we can all relate to. For lovers of Italy, you will be enthralled with her insightful, sometimes funny, descriptions of Italians and Italian life. Her background as a history professor is an added bonus as she intersperses fascinating pieces of historical information throughout the book. I picked up this book because I'm interested in walking the Way of St Francis, but got so much more than a taste of hiking in Italy. Enjoyed the story and cheered on Chandi, but also got an idea of what it will be like if I ever do it. What a brave woman. I loved her belief that the world is a good place that will take care of you. We all need to believe that. I'm a sucker for a pilgrimage story because I find that though people have done them since before recorded history, something profound and personal happens in every person that takes one. And when that person writes about it so honestly and skillfully as Chandi does in Return to Glow, and takes us through Italy as a bonus, the result is a wonderful, rewarding read. This book captures the woman’s transformative journey across Italy. The author tells a personal story of struggle and her will and tenacity is inspiring. A page turner for sure, however I found myself like a miser not wanting the book to end, and rationing our the last few chapters. It beautifully captures the Italian culture, and will make you hungry for adventure. Highly recommend!!! I enjoyed the insights about places I've seen in Italy, and those I haven't seen. The larger story behind the pilgrimage provides a context and an unfolding added story. The pilgrimage itself is interesting to me (a friend is currently on the Spain/Portgual version) and I could imagine doing one of them in another life. Enjoyable. I enjoyed the beautiful journey through the Italian countryside. Her journey was so difficult both physically and emotionally. Chandi is a world traveler, photographer, writer and historian. She's lived in Qatar, India, Italy, Switzerland and England, and has been returning to Italy with unremitting passion since she first lived there at age 20. Her memoir about her 40-day pilgrimage walk in Italy was published in the spring of 2017 and has been featured on numerous travel websites and podcasts to rave reviews. Chandi has Chandi is a world traveler, photographer, writer and historian. She's lived in Qatar, India, Italy, Switzerland and England, and has been returning to Italy with unremitting passion since she first lived there at age 20. Her memoir about her 40-day pilgrimage walk in Italy was published in the spring of 2017 and has been featured on numerous travel websites and podcasts to rave reviews. Chandi has a master's degree in Florentine Renaissance history and has taught at colleges in the US and overseas. She has recently moved to Tuscany where she's working on her next book, and blogging about how to move to Italy.